Everyone wants to know when should they replace their old windows. Generally, homeowners replace their windows if their room is cold in winter or hot in summer, they can’t get them to open or close, their current windows are leaking water or air, the glass is cracked or broken, or because they are more than 10 years old. Window replacements can be one of the most important investments you can make for your home. With new windows you can lower your energy bills, increase the value of your property, and add safety and peace of mind. 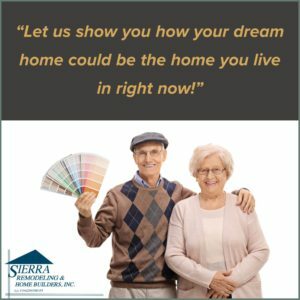 Sierra Remodeling offers one of the most energy efficient windows on the market today! As your exclusive MI Windows dealer, we can guarantee that your windows will be meticulously crafted with the latest advances in technology for unmatched quality, efficiency, clarity and durability. All MI Windows & Doors products are tested in independent testing facilities and meet or exceed the most rigorous Energy Star, AAMA and NFRC certifications. As a result, MI Windows delivers absolute performance backed by an outstanding warranty.